Mumbai, July 24 (IANS) Actor- filmmaker Shreyas Talpade says he wanted the “Ghayal” star Sunny Deol to play a role in “Poster Boys” to add credibility to the film, which has a “little sensitive subject”. 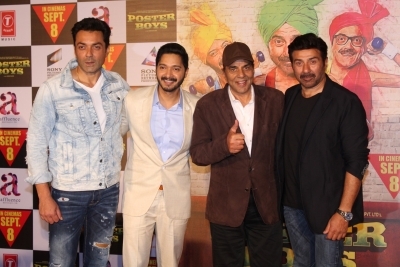 “Poster Boys” is the official remake of Shreyas’s production venture in Marathi “Poshter Boyz”, based on three characters who find their pictures on a vasectomy poster. 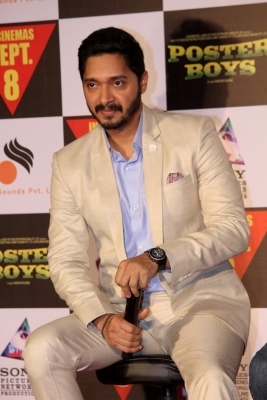 Shreyas was speaking at the trailer launch of his directorial “Poster Boys” here. The launch was attended by Sunny, Bobby Deol, Dharmendra and Sonali Kulkarni. “The script is very interesting and when it’s a great idea, the actor just wants to grab it. It gave me an opportunity to do something which I wouldn’t have done otherwise,” said Sunny, known for playing action roles. Bobby, who is playing one of the lead characters, spoke about the dialect he had to use for the film. Sneha Rajani, President and Head, Sony Pictures Networks Productions, one of the producers of the film, said Shreyas was not ready to make the film without Sunny and Bobby. “I was told to watch the Marathi film, and the impact it had on me was tremendous. I immediately got in touch with Shreyas. I just had to be a part of the film. It’s such a wonderful film,” added Rajani. Dharmendra was so impressed with the trailer of “Poster Boys” that he said Shreyas should start working on its sequel. “I had heard that the Marathi film was a big hit. But after watching this trailer, I can say that this will be a bigger hit than the original. I think ‘Poster Boys 2’ should also come out. Shreyas should start working on a sequel,” Dharmendra said. “Poster Boys” is scheduled to release on September 8.